53.50 Lac 1 Kanal Plot price with Development Charges or nor ? It is without development charges. please update the prices and please suggest if the balloting will be in 5 years or more? Asif Iqbal, Why are you so reluctant to tell about the official launch date for Phase 10? I do not have any official launch date, you are requested to please contact DHA Lahore for any further assistance. Atif bahi , AOA, I think in presence of DHA BAHAWALPUR, DHA MULTAN & DHA GUJRANAWALA, INVESTERS / COMMON MAN IS NOT FOCUSING LAHORE FOR PERMANENT SETTLEMENT . THAT WHY TREND IS CHANGING TOWARD LOCAL DHA, S . FOR EXAMPLE DHA BAHAWALPUR IS SETING AN NEW LAND MARK FOR LOCAL RESIDENTS. ALL OTHER DHA, S ARE LOW PRICED AND LIMITED TIME DEVELOPMENT. SO THATS WHY PRICES OF PHASE 10 HAS DROPPED. AND IT WILL TAKE AT LEAST 10 YEARS TO RESIDE IN PHASE 10. It is same for every business in big cities. We have witness that famous markets for Lahore has no more attraction for public as monopoly as these were few years back. Even now maximum brands are almost available in every corner of Lahore and other major at least 20 cities cities. When we talk about Bahawalpur it is among 13th largest city of Pakistan as per population. But we know by opening branches of these brands in almost major cities did not effect the sale of main cities like Lahore Karachi and Islamabad. However mean while it has an effect. There was time when people near surroundings of Lahore visit Lahore shopping etc. on every main occasion but not they dont need to come to Lahore as their own cities have almost all major brands now. Same we can say for the property, now different brands are expanding their housing developments in different cities like DHA. So we can say that DHA Phase 10 prices are effected due to these cities but soon once DHA Phase 9 Prism prices will improve it is automatically have effect on DHA Phase 10 as well. DHA Phase 10 is a long term project. Thats why its prices are coming down also Phase 9 took correction on last one year. Now Phase 9 is going towards development, once it will be possession area, prices of Phase 10 will also improve mean while. please upto price of one kanal file. It is almost 10 lac down within last 6-7 months . How much it will lose within next one year becuase 2018 seems to a bad year for property. Now people are buying plots on ground. So no one is interested in buying files. what is ur analysis ??? It is your opinion, but in fact people are now investing in low budget. Due to slow market people are interested to invest in big budgets. DHA 10 is a long term project and will take time. what is dha phase 10 (1 kanal ) file rate…? Also how much extras expenses on top of file rate required. What is best mean to get a file from? DHA Phase 10 will be a long term project. Current rate is around 57 to 58 lacs. If you buy affidavit you have to pay transfer fee of Rs. 10,000 and Membership fee of 50,0000. In case of allocation you have to pay full transfer like a plot. That will approximately 4 lacs in case of filer and in case of non file it will be approx 5 lacs. Please contact Rana Nabeel +923224992200 if you are interested in buying of DHA Phase 10 but keeping in mind it is a long term investment. 1- Affidavit file transfer fee vary between 6500 to 20000 for normal to urgent transfer respectively. Purchase is not charges any CVT, Stamp Duty and Advance Tax. 2- Affidavit file can be transfer without presence of Seller and Buyer in DHA Office. But for allocation letter collection Buyer must present himself to collect allocation letter. 3- Allocation file transfer fee is charged as regular plot including full DHA Transfer Fee, Advance Tax on Purchase, Capital Value Tax (CVT), Stamp Duty and any other Govt. charges. For Allocation files Seller and Buyer must be present in DHA Office, except Overseas Buyer Transfer or On Behalf of Buyer Transfer in case of DHA Bahawalpur. But for allocation letter collection Buyer must present himself to collect allocation letter. 5- Affidavit files rate is usually more then Allocation files due to difference of transfer fee. 6- Affidavit files can be transfer within 3 to 4 days, where as allocations files required NDC and take 7 to 10 days to transfer. Is it available on Installments or only cash files available.? If there is any DHA project in Lahore on Installments the please let me know. At the moment no instalment plan available for DHA Phase 10 Lahore. Could you please guide about the potential of phase 10 for short term (1 year) investment. DHA Phase 10 will be a good gainer in two years holding time in this budget. Other then DHA Bahawalpur other Chapter of DHA Lahore are touching bracket of 50 lacs and are out side of Lahore. Where as DHA Phase 10 Lahore is at 57.25 lacs today. If DHA Multan, Peshawar, Gujranwala cross limit of 55 lacs then investor would have choice of DHA Lahore Phase 10 as well as substitute. DHA Multan has launched booking we have already given a detail analysis for DHA Multan up front amount payment with the passage of time. You may have a look at DHA Multan up front payment analysis to under stand that after 1 year what will be DHA Multan up front payment plus own price. How much chance to merge grand avenue in DHA 10 ? We have no such information about merger of DHA Lahore Phase 10 & Grand Avenue. Just I want your Idea as you can analyze with your experience . I didn’t asked about information . So kindly share your most experienced idea about grand avenue merger in phase x . Waiting for your respective answer ? Brother experience has nothing to do with the analysis of merger. It is people opinions, but I think that opinion should be based on some information. As we do not have any such information so cannot say any thing. However every thing possible. It may later merge with DHA 10 or it may not. when is the official launch of PHase 10, expected. Atif sahib ,AOA, what do u mean by count down . May I know what will be physical location of phase10. How much time it will take from start to possession of plots . How would u compare phase 10 with phase 9. DHA now converted DHA Phase 9 Extension into DHA Phase 10. It was already supposed to do the same. DHA Phase 10 Location is next to DHA Phase 9 across the Hudiara Drain up to Sue Asal Road along with Bedian Road. 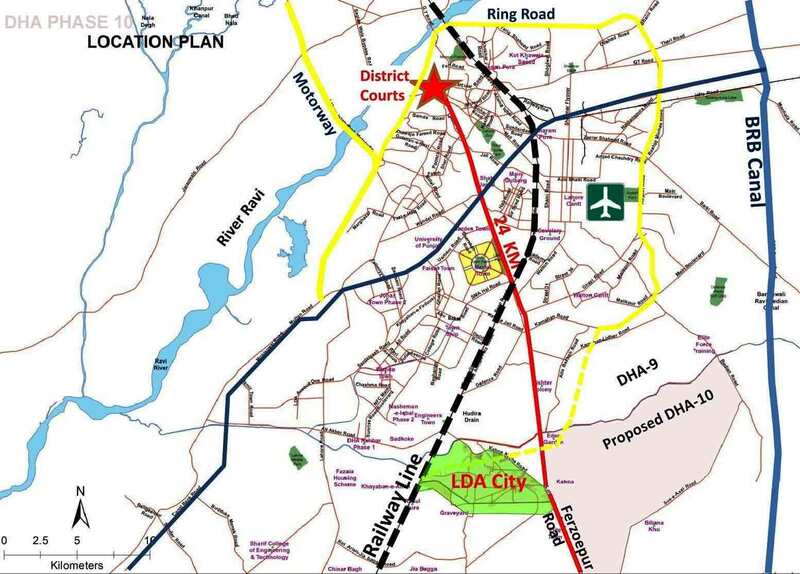 It will consist of 125,000 Kanal area and will the largest Phase of DHA Lahore. It will take time to developed, at the moment Phase 9 Development is going on. Phase 9 may take 3 to 4 years to be developed. It mean that Phase 10 will be development till 2024 or 2025.